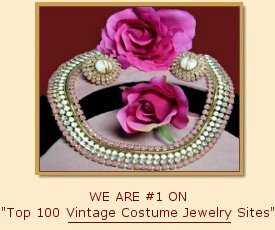 Vintage costume jewelry to accessorize, adorn and enhance your personal style has been very popular for decades. Whether delicate, elegant, or subtle, huge, razzle-dazzle, exotic, or bold, the lure of these "jewels" can be deliciously irresistible. No matter how much vintage jewelry we have... we can always find room for one more piece! My goal has been to select and to make available to my visitors the finest examples of vintage costume jewelry. The fine workmanship, brilliant stones and quality settings of the past, set these pieces apart from the norm. Acquiring such a fine vintage jewelry piece also sets you apart from the norm and serves as a wise investment for the future. I do hope you will enjoy visiting my vintage jewelry shop. 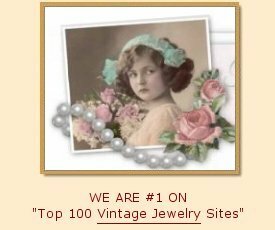 To begin your jewelry journey, click on a category below and open the door to "Vintage and More!"